What has the Carroll County Resource Council done in infrastructure funding? We could not be more proud of Smoke-Free Soccer alumnus Henry Pineda, recent graduate from Williams Baptist College. We have been glad to help the City of Green Forest with a number of infrastructure grants to restore its historic water tower, to create the walking trail at the City Park and to build sidewalks allowing children to walk safely to school. What kind of projects does the Carroll County Resource Council take on? Take a look at one of our proudest projects. HOME SMOKE-FREE SOCCER INFRASTRUCTURE SAFE ROUTES TO SCHOOL CAN WE HELP? Finding funds to acquire the 100-year-old Green Forest railway depot from a local rancher using it as a hay barn, helping to find funds to move it to Green Forest's Veterans City Park across from the Marvin Russell baseball complex, helping find funds to restore and renovate the depot, turning it into the city Community Center. 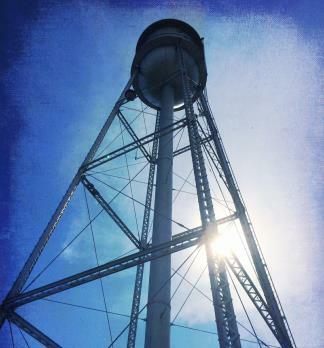 Finding funding to restore the historic Green Forest water tower when other towns were tearing down theirs. We believed ours was a landmark worth keeping. Securing funding for the walking path at Veterans City Park. Collaborating with a local Eagle Scout and the Northwest Arkansas Workforce Development summer youth program to build a natural rock patio at Veteran City Park's historic veterans memorial monument. Finding funds for acquiring, then developing the 11-acre soccer complex at Veterans City Park in collaboration with North Arkansas College. Collaborating with the City of Green Forest and the Green Forest School District during the renovation of Tiger Stadium to acquire the old stadium's lighting, bleachers and ticket booth for the soccer complex. Finding funding for sidewalks connecting neighborhoods on the east side of Green Forest with the school, allowing students to walk and bicycle safely to class.